Most popular interior design styles - Which one are you? A recent survey by realestate.com.au found that Australians continue to opt for modern interiors as their most preferred interior design style. However many would agree that the word ‘modern’ often means different things to different people. For some it means the ultra-modern look with sharp edges and bright solid colours, but for other homeowners modern means clean, bright and uncluttered. Many interior styles complement one another, and there always the opportunity to use different interior design styles in different rooms of the house to give each a distinct feel. Our interior design team here at Adina Designed Interiors can create modern, traditional, rustic, Mediterranean, Asian or old world style furnishings, fixtures and fittings in your home to help create your ideal interior design style. We explain some of the characteristics of popular interiors styles below. Leaving plenty of space in the centre of the room is widely adopted in Asian inspired interiors. Low set furniture pieces and light grain timber are used as are strand woven floor mats and rugs and lots of light. 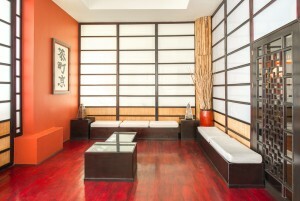 In recent years Asian interior design has closely aligned and even overlapped with minimalist and modern interiors. Natural solid colours including stone, natural greens and a lack of intricate patterns are common in Japanese themed rooms, where Chinese interiors tend to opt for darker timbers brighter colours and patterns including reds and yellows. Inspired by the bright, offbeat colours of the 50s, 60s and 70s, retro styles are making a huge comeback as the anti-thesis to the modern minimalist look. Bright colours, patterns and loud wall papers have been reimagined in a modern retro design with an eclectic mix of vintage inspired materials is the common theme in this broad interior style. The common theme is an older style from decades past with a modern twist. A country farmhouse or a country cottage style interior focuses on warm and cosy features. Use of timber cabinetry and patterns including stripes and floral accents are highly embraced, along with bulky furniture. Walls in kitchens are adorned with utensils, crockery is showcased and pictures of landscapes are hung. Exposed structural materials of the building are widely featured in an urban or industrial interior design. From rendered or exposed brickwork, corrugated or galvanised steel, polished concrete and a darker colour scheme characterise the urban and industrial interior. Other non-functional elements are added to help create the outdoor space. Just tell us your vision and we will create it here at Adina Designed Interiors. We can match our kitchens, cabinetry, custom made furniture and other interior design features to match your vision and your preferred interior design style. At Adina Designed Interiors we love interiors and we look forward to transforming your indoors soon. This entry was posted in Advice and Infomation, Interior Design by admin. Bookmark the permalink.